October 2016 was a significant month for The Anti-Cruelty Society of Chicago as it celebrated Adopt-a-Shelter-Dog month. Echo Limousine, one of Chicago’s top limo and car services company, has been excited to assist with fundraising to help meet these important goals. Animals in the Chicago area have a reputable organization standing ready to assist them in times of need. With an open-door policy, this shelter will never turn away an animal in need. The Anti-Cruelty Society is the biggest and oldest organization in this city. Not only does it shelter homeless animals, but it also educates the public with services and programs. Services currently in place include sliding scale spaying and neutering, adoptions, sliding scale veterinary services, rescue for animals in abusive homes, and more. Estimates suggest that between 3 and 4 million animals are currently awaiting adoption in shelters. Some overburdened shelters have no choice but to euthanize animals that are not adopted. With Pet Adoption Month, shelters hope to raise awareness of their animals that would make ideal family pets. 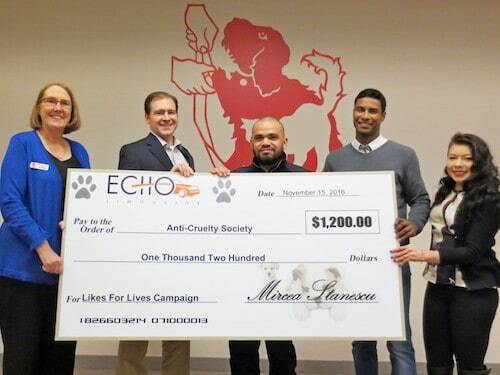 By applying its limo and car services to this worthy charity, Echo Limousine committed to donating $1 to the Anti-Cruelty Society of Chicago for every new Facebook “like” received. Consumers have a fast and simple way to help the shelter meet fundraising goals, simply by visiting Facebook. Anyone wishing to make even more of an impact can contact the organization directly to make a contribution or to adopt a pet. By prioritizing customer service, Echo Limousine has been able to climb steadily to the top of the limo and car services industry. Impeccable attention to detail and a responsive staff ensures the best experience for customers. Echo Limousine is not only focused on customer satisfaction, but the company also seeks to ensure the welfare of furry friends and the community as well.